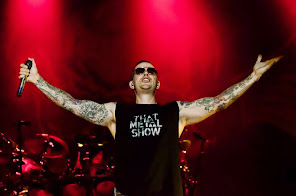 Lightning-fast players, screaming vocalists and thundergods reigned over what M. Shadows of headliner Avenged Sevenfold claimed from the stage to be the largest Mayhem Fest crowd at the venue in the event’s seven years of existence. According to organizers, 27,000 metal fans trekked to the hills of Glen Helen to see 19 bands, nearly doubling last year’s attendance. The oversized archways above the band featured video screens, and when A7x played the title track from the new record a few songs in, a 15-foot-tall skeleton king appeared on a throne from the center archway, much to the audience’s delight. While the crowd was clearly bewitched by Avenged Sevenfold, the band was only the finale to a day packed with notable performances by other California bands.